It appears that this is not the section to post reviews of Rent a Tiger, as it apparently is seldom read nor added to. So, I will attempt to put my comments on the forum under a different section. It also appears that there are few forum members who even "search" this area. And, I believe my comments need to go out to as many members as possible. Should someone wish to rent a motorcycle for riding anywhere in Europe, THIS IS THE COMPANY TO DO BUSINESS WITH. Anton Alabau, owner of Rent a Tiger, is one of the finest men I have ever met. And, his business practices are the very best I have ever encountered. He, and his lovely wife Ana, run a company with impeccable customer service and wonderfully maintained motorcycles. They truly care about their customers. My wife and I rented two Tiger XCs, for 28 days, to ride in Spain, France, Germany, Austria, Switzerland and Italy. Although the Tigers ran great, we had more troubles than were expected, including an accident involving my wife. In every case, Anton came up with a solution. His attention to the needs of his customers is exceptional. And, he is one of the finest problem solvers I have ever met. When you are in a different country, and do not speak the language, this kind of person is invaluable. All of this..... great motorcycles, great rates, fantastic customer service and a caring, helpful company..... adds up to making Rent a Tiger a top company for motorcycle tours and rental in Europe. Even if I were considering riding in eastern Europe, I would rent from Rent a Tiger and put it on a ferry or a train. His rates are reasonable. His motorcycles are exceptional. And is customer service is first rate. 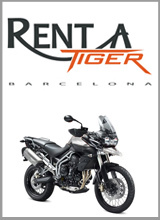 Rent a Tiger does Moroccan tours, and tours of the Pyrenees. But I was told custom tours are something Anton can easily do. His vast experience in travel is outstanding. I sound like an "ad man" for Rent a Tiger. But, in fact, my wife and I are very, very happy customers whose trip was salvaged many times by Anton and Rent a Tiger. As customers, we owe this man so much. He made the impossible possible. Thank you Anton Alabau and Rent a Tiger for all the help and service. And, the friendship. We will be back. I had nearly the opposite experience of this company. I traveled to Barcelona from my home in Australia with my wife hoping a 4 day bike tour would convince her we should do more trips in the future. The owner from Rent-a-Tiger was on a tour in Morocco so the bike keys were handed over to me by a bloke called Josep who told me at that time not to worry too much if I exceeded the number of 300kms per day because they turn a blind eye to a few clicks. I headed out of Barcelona towards Pamplona and the bike wouldn't restart in Lleida. Starter motor was stuffed. The bike had around 52,000 on the clock. One whole day later the bike was operational but I was really cautious about taking it into the back blocks in case it broke down again. So we had to rejig the plans. One plan was just to leave it in Lleida and go rent a car for the remaining days of our holiday. The other issue was my wife's helmet visor came loose in the first few hours of riding. The nut on the visor hinge had fallen off. The dealer in Alcarras where the starter motor was replaced also replaced the brain bucket. So cautiously I planned a revised trip and we returned the bike back to Barcelona then got slugged 25Euro for a few extra kms! Compensation was in the form of a day off the rental agreement as per their standard contract. Nothing for having to stay in an unscheduled hotel in Lleida nor all the phone calls and texts that the Australian telco called Telstra were charging me like a wounded bull. So the magical Mr Problem solver was on sketchy phone communications down in Morocco, leaving the business to itself and Josep in Barcelona. So what are the chances of a big thumbs up from me for Rent-on-Tiger? 2 Hopes: Bob and None! Couldn't agree less with RugbyBud! Sounds like the bike was repaired in a timely fashion (next day), and the helmet replaced at the same time - that doesn't sound like bad service to me. Things do go wrong on an adventure, so you should be prepared to make the most of them. If you want cheap and relaible - hire a car, and yawn your way around the country. My freind (also over from Oz) and me hired the bikes for 7 days (unlimited mileage on 7 day hires), and enjoyed a great trip around Spain, France, and Andorra in hot sun, mist, and heavy rain, and the bikes behaved themselves all the time. I've hired bikes in other parts of Spain, and I can tell you they are not as good quality as these or repaired as well. I spent a fair bit of time shopping around before deciding on Rent a Tiger, but found Anton quick to respond, fair and someone I could do business with. I don't like dealing with anyone I don't trust, so I didn't make my decision lightly. I found Anton reliable and easy to deal with at all times. I am considering going on one of the Morrocan tours next year with Rent a Tiger. Aprilia Pegaso 650 single (2000) - Sorta burgundy? In addition - I've just noticed RugbyBud has just the one post (above) to his name. I'm not particularly knocking him, he's welcome to his opinion, but it doesn't sound to me like a rounded opinion or forum user. So sorry I must have missed the instructions when signing up to this forum that says the more posts you have the more "rounded opinion" you must have. I must be used to the BMW forum where the number of posts you have done is not of any relevance to an opinion posted on a forum. This is a bit of a convoluted discussion on here and it's also getting a bit silly. Maybe time to put this thread to bed and all act more maturely?